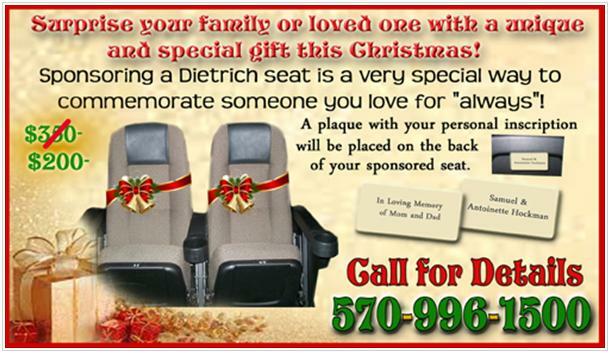 Create a lasting tribute and memento by personalizing a seat at The Dietrich Theater! With a tax-deductible gift of $200 you can help the Dietrich, Wyoming County Cultural Center, and create a lasting gift by purchasing and personalizing a seat in one of the theater's auditoriums. An engraved plaque will be permanently affixed to the seat bearing the name of the person, family or business being honored. There are still a few seats left in our two new theaters. Seats will be allocated on a first come, first served basis. Your participation in this seat campaign will allow future generations to enjoy entertainment at the WCCC/Dietrich Theater. Please call 570-996-1509 for information on how to purchase your seat sponsorship.